When it comes to decorating your home, decluttering is probably the first and most important step. Without removing dust collecting trinkets and other useless items that are piling up around your home, you’ll never see the bigger picture of how, where and with what you should be decorating. When it comes to decorating on a budget, having a plan is extremely important in order to respect your finances. If you’ve caught yourself saying: I need cash now, then keep reading! You may be tempted to quickly remove the clutter from your home and send it all into the garage. However, does sending the clutter and mess elsewhere really solve the problem? Learn more about budget garage storage ideas that will ensure you not only eliminate the clutter from your home, but avoid the accumulation from occuring in the garage! 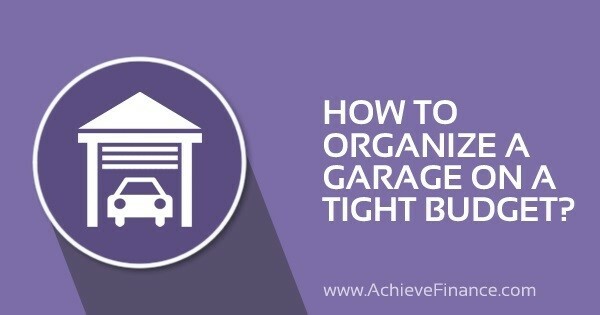 Don’t start off with the idea that organizing a garage is a one-stop deal – it’s not. To the contrary in fact, everyone’s garage needs are different and for that reason, we’ve compiled a list of the top tricks to organizing and making the most of your garage space. We all know that the garage is not the biggest space in the house – especially once the car is parked inside. So, how to fit a storage unit between the wall and the side of your car? Don’t stress it. The practical storage wall solves the problem for you, allowing you to benefit from a solid mounting for shelves and hooks without getting too close to your vehicle! This type of mounting unit is created with a framework of horizontally positioned wood strips and shelves. It’s so solid that it can hold several hundred pounds of tools and other garage-related items. Easy to make on your own and very inexpensive, this storage idea is equally easy to organize and reorganize time and time again. You can get dual use out of your ball storage rack by building it slightly bigger. Try 12 in. wide x 25 in. high x 16 in. deep. Once you’ve got your elastic cord threaded through the holes in the wood in order to create a netting, you can start thinking about optimizing the outside of your storage rack. By adding a few hooks or short gutter troughs, storing smaller balls or other outside toys or sports gear becomes much easier. Are you rather jealous of the storage walls with rearrangeable vertical slats as well as various sized hooks and bins found in most all sport good stores? Well, guess what, you can easily incorporate this innovative retail system into your own home garage! In fact, this can be considered a pretty simple Do-it-Yourself weekend project – with quick and easy installation, your storage system will be up and running in no time. Better yet, your new storage can be reorganized and adapted to your needs as they change. There’s no need to point it out, but for most people, a garage can become quite the clutter zone – what, with all the different home improvement projects and seasonal gear, it’s to be expected right? Well sure, but if your situation resembles the latter one, then garage cabinets are likely to become your best friend. Before purchasing your cabinets, plan out your garage setup py taping the floor where you plan on placing your new storage units. Doing so will ensure that everything fits accordingly once you get back from the store. Best of all, an 8-foot melamine and pine storage unit will only cost you an approximate $27! This may seem pretty simple at first glance, however, bins can actually cause quite a problem when it comes to a cluttered garage. In most cases, these plastic storage bins get piled one on top of the other against a wall, making it literally near impossible to reach the bottom bin – especially for kids. To avoid the extra hassle, try storing your bins horizontally on a shelf. You can choose different coloured bins for different accessories and gear, making access all the more simple. Another easy trick would be to abolish the single bins completely and choose storage towers, which are an excellent means in saving space and storing efficiently. Tip: The outside of the storage tower can be used to install hooks and hang lightweight sports equipment! Often times, differents car lubricants, oils and fluids can get pretty messy and in general, you want to keep such latter items away from children as much as possible. A good way to organize all your products for your vehicle all while keeping your family safe is to get yourself a cabinet that can store all these items. A fold-up door on special hinges is ideal for it doesn’t take up too much space and the door doesn’t swing outward when opening it up – avoiding any unwanted damage to your car! Having to stick to a budget is often easier said than done however, by following the above ideas to maximizing your garage space, you’ll be well on your way to an organized, easily accessed garage in no time without ever breaking the bank!